Gordon is a 48 year old High School Math/Computer Programming teacher. He has been teaching in Wilburton's small rural high school for 23 years. His wife of 25 years, Cindy, is also a teacher -- the 2nd grade at Wilburton Elementary. They have three children: Gordon, Jr, 19 and a sophomore at the school of engineering at the University of Oklahoma. 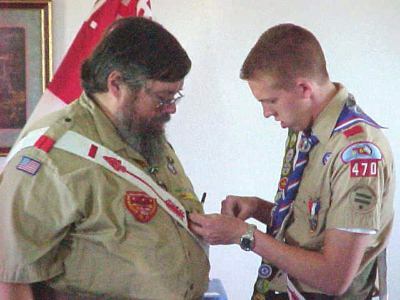 He's also an Eagle Scout. Mike, 15, a true teenager, is close to getting his Eagle but needs to work on his paper work. Regina, 4, is a post-40 gift from God. Gordon got his love for cryptograms from his mother and from a statistics teacher in college whose hobby was breaking codes. Gordon says, "She taught me a lot." Gordon started solving on-line two years ago, and currently solves about 20 puzzles a day. Gordon's email address is: mrbockus@hotmail.com (or) gbockus@cwis.net. A couple of pictures just came in from Gordon, taken May 26, 2001. 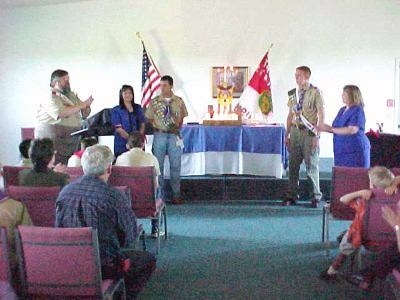 The first is a ceremony, an Eagle Court of Honor for Gordon's son, Mike. The second is a pix of Mike pinning an Eagle's Dad pin on Gordon.